From storywriter (Good Gossip, 1991) and novelist (The Other Family, 1996, etc.) 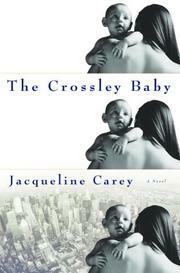 Carey: a tale about three suburban sisters on very different paths, and the responses of the others when one dies. Their mother dead, the Crossley girls—Bridget, Jean, and Sunny—grew up in a working-class Long Island town with barely-present accountant father Ed. Though of completely different natures, the girls laugh off stories of family feuds, getting along well enough until oblique, unconventional, single-mother Bridget, the oldest, dies in a botched operation. Sunny, the youngest, pretty and popular, floats through a benevolent world until she finds and marries Leon, an idealistic slumlord. Now the mother of two, Sunny is the perfect middle-class Earth Mother and assumes that Jade will join her family. Jean—a pragmatic, cynical, dynamic businesswoman—surprises all when latent maternal instinct and competitiveness lead her to hold onto the baby after Bridget’s wake, and the sisters are soon vying to adopt her. While the emotional landscape never really changes—Jean sees relationships as business negotiations with winners and losers, and she will not be the loser; Sunny’s nature compels her to do what she feels is right, which Jean sees as manipulative and sentimental posturing—economics supply plot complications. Jean is suing the hospital for wrongful death on Jade’s behalf, but her biggest client asks her to back off. Sunny, who makes the case in family court that Jade would do better with a stay-at-home mom, is forced by the collapse of Leon’s real estate business to get a job. The new circumstances bring the sisters to an uneasy truce, the feud bridged by their mutual love for Jade. Accomplished and insightful, but oddly disjointed; showing her strengths as a storywriter rather than a novelist, Carey makes each segment engaging, but with little forward motion.